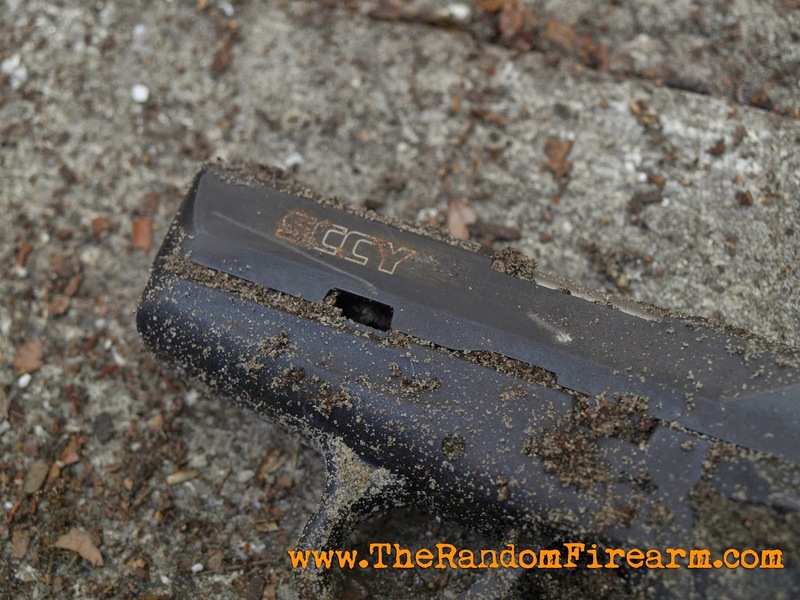 If you’ve been following this blog, then you know I recently buried my SCCY CPX-2. I said that in two weeks I would dig it up, take it to the range, and see how it holds up. Well, it’s been two weeks and I have dug it up. I was a little surprised with the results. First off, there was not as much rust as I expected there to be on the firearm itself. The magazines were trashed, which I did expect, but I have yet to test their functionality because of what happened next. 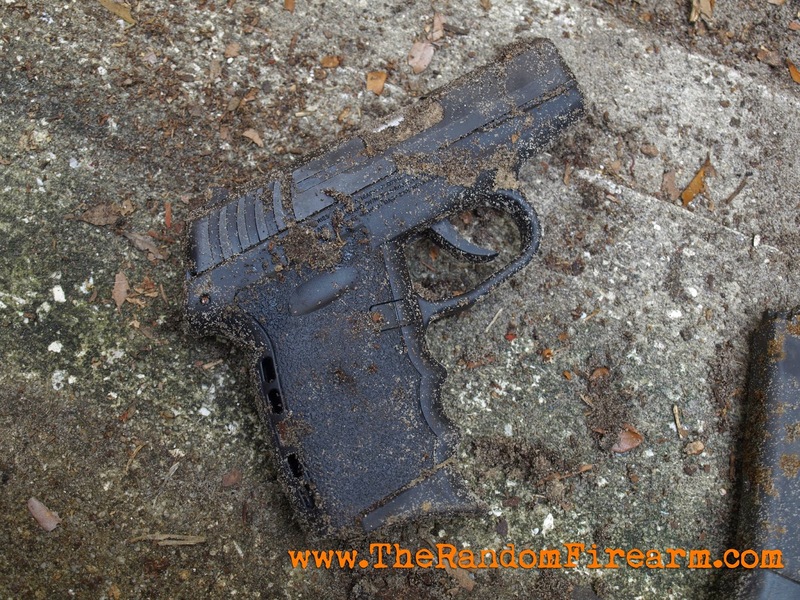 I was not going to fire the firearm in its covered in dirt condition, so I hosed it down. When I attempted to pull the trigger, it pulled back, and that was it. 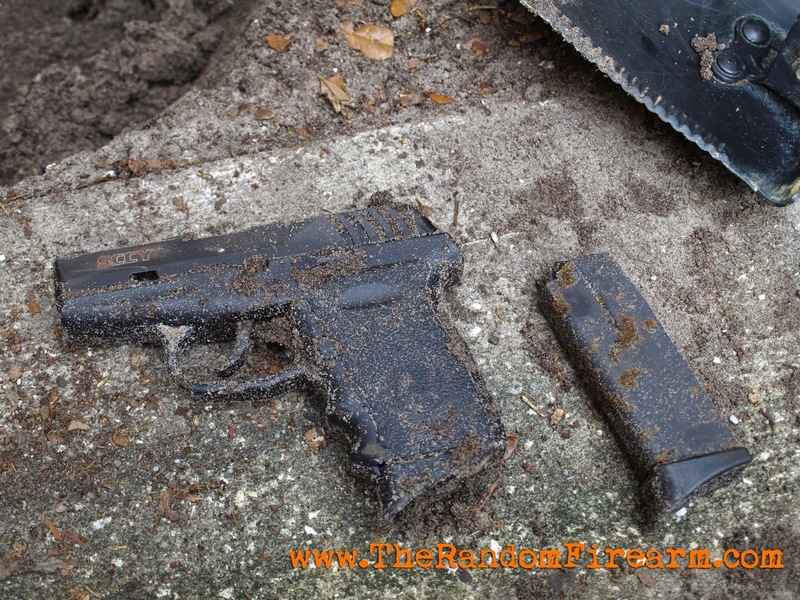 After only being buried for two weeks, the trigger failed before even making it to the range. I was not expecting that to happen. I have many more tests planned for this SCCY, so I am going to attempt to fix it. Want to see the results? You’ll just have to stay tuned to find out! To see all that happens with this CPX2, keep following this blog, don’t for get to subscribe to our YouTube channel, like us on Facebook, and follow us on Twitter! That will ensure you see all the tests to come. This blog is indeed called The Random FIREARM, but knives are also an important subject in the firearm community, and even day to day life for most people. They are a tool that can be used for SO many things: opening letters, opening a box, unscrewing something, or maybe even slicing a seatbelt to save someone’s life. Of course, they can be used by bad people for bad things, and just like people are trying to ban “evil” firearms now, back in the 1950s, people were trying to ban “evil” knives. Webster defines a switchblade as “a large jackknife that snaps open when a release button is pressed”. Seems harmless right? I mean today we have assisted opening knives that are quite popular. Well, back in the 1950s, this was labeled as “the toy that kills”. I originally stumbled up this article by the Brooklyn Public Library that covers in detail the story about how the knives were originally banned in New York, USA. A three-year campaign for the ban of these knives was waged on, lead by Special Sessions Justice John E. Cone, who had previously been the Chief of Justice of the Homicide Bureau in the District Attorney’s Office in New York. In this position, he had seen what switchblades apparently were in the eyes of the youth. He claimed "...it was a badge of distinction among teen-age gang members to possess a switchblade or zip-gun." Like today with people trying to ban “evil black guns”, there were people who fought against it. After some time, the only law that changed prohibited the sale of switchblades to those under 16. After supporters FOR the ban like the newspaper The Brooklyn Daily Eagle continued to pester the state government for a full on ban, eventually and unfortunately, a bad was passed. On March 28th, 1954, New York became the first state in the nation to ban the manufacture, sale, and possession of switchblades. After that, more states followed. After the ban was passed, citizens of New York were allowed to turn in their evil knives without questions, and many did. It’s funny to be reading this now and seeing that we are in a similar situation with organizations and agencies trying to ban certain types of ammunition, firearms, and whatnot. Legislation has passed in history, and we can see that can take things away from us, and it can always happen again. Just keep your eyes open, and support what you believe in.